On an unseasonably warm November Saturday, participants in the 2012 Dakota Commemorative Walk traveled from their lunch stop at the Treaty Site History Center, just north of St. Peter, toward Henderson. The grass at the side of Highway 169 was drained of color, dry and crunchy underfoot. A steady hum of traffic shot by the procession of marchers and slow moving cars on one side while the Minnesota River was visible on the other. On the horizon, bare branches of oak and cottonwood trees stood out against blue sky. The Dakota Commemorative Walk remembers and honors the 1,700 Dakota women, children and elders who were forcibly marched 150 miles by U.S. military troops from the site of the present-day town of Morton to Fort Snelling. Following the battles of the 1862 Dakota-U.S. War, 303 Dakota men were arrested and awaited trial. Meanwhile, an indiscriminate sweep of Dakota communities resulted in another approximately 1,700 Dakota people, who had not participated in the fighting and had surrendered at the end of the war, being removed from their homeland. 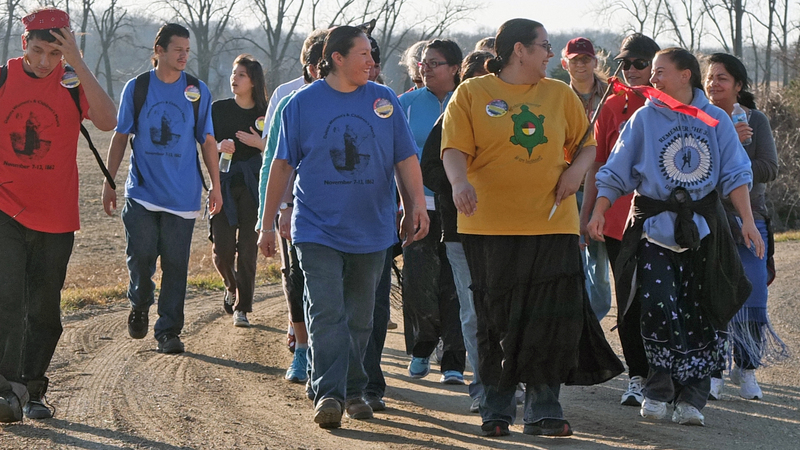 The 2012 walk started November 7 at the Lower Sioux Agency Historical Site on Highway 2 near Morton. Every mile, the walkers come to a stop and gather to plant a prayer flag, a dogwood stake tied with red cloth and a leather ribbons bearing the names of two Dakota families who made this march 150 years ago. One of the group’s leaders holding a leather bag of tobacco sang a prayer song while participants filed by, taking a pinch to offer along with prayer. Organizers describe the walk as spiritual, sharing values with the Wokiksuye 38+2 Horse Ride, portrayed in the film Dakota 38, a healing journey that begins in South Dakota and arrives in Mankato on December 26, the anniversary of the execution by hanging of 38 Dakota men. There is no record of the route the captives marched, but it has been reconstructed by piecing together fragments of historical record, personal memory and guesswork. According to Mary Beth Faimon, who worked with others to devise the first walking route in 2002, railroad tracks were most likely followed because they connected towns. “They made a point to bring the prisoners through the towns so they could have a spectacle,” she explained. Today’s route has changed somewhat to ensure safe roads for the walkers. “The point is that it’s all Dakota land — wherever they walk, it’s in the footsteps of their ancestors!” said Faimon. The lunch stop at the treaty site had particular significance for the walkers. It is the place where the Treaty of Traverse de Sioux was signed in 1851. According to materials at the Treaty Site History Center, the Dakota ceded “24 million acres…nearly forty percent of what we know today as Minnesota” to the U.S. government. Treaty negotiations were fraught with deceit and the Dakota people were pressured to radically change their way of life as European settlers flowed into the region. The food was purchased from the St. Peter Food Coop with donations from the Gustavus Diversity Center, Building Bridges, and Office of the Provost, and was served by students and Kyle Momsen, a staff member, from Gustavus Adolphus College. Momsen explained that some of the students had participated in a January Interim Experience course about the war. The class produced an exhibit, Commemorating Controversy: The Dakota – U.S. War of 1862. It’s a collection of 12 panels that explores the war’s history, events, and consequences. It has been on display at Winona State University, in Washington D.C. at President Lincoln’s Cottage and is currently on exhibit in the Twin Cities at the student union at Augsburg College. Read about the walk in the words and pictures of Dakota people in The Footsteps of our Ancestors, edited by Waziyatawin Angela Cavender Wilson. Diane Wilson’s Spirit Car, a One Minneapolis, One Read selection this year, tells about the first-ever 2002 Dakota Commemorative Walk. CORRECTION: The food was purchased from the St. Peter Food Coop with donations from the Gustavus Diversity Center, Building Bridges, and Office of the Provost. At the newly renovated and reopened Bell Museum, the voices of Ojibwe and Dakota children inform about natural science dioramas, depicting nature scenes from around Minnesota. The inclusion of these voices was intentional, hoping to showcase the persisting existence of these languages in the face of cultural destruction through colonization.